Garment bags are primarily designed to keep business travelers happy. The purpose of a garment bag is to safely transport formal clothing from one place to another. You will have seen them before. When you buy a suit, it generally comes with a garment bag, for example. That’s because it’ll keep it clean, free of creases, and is a comfortable way of transporting it around. Fortunately, there are many. Many different garment bags are in production, and for a reasonable price you can pick up a great one. A perfect example of the best men’s garment bag for travel would be ZEGUR Suit Carry On Garment Bag for Travel & Business Trips With Shoulder Strap it will keep your clothes clean and unwrinkled whilst allowing you to look great whilst you travel and transport them around. There are many types of garment bags that you can get. From rolling carry on garment bags to a luxury garment bag, you will be able to find one that suits your needs. Sometimes, a garment bag is all you need to travel, and sometimes you will just get a garment bag that you can place inside of your larger suitcase. However, if picking out a perfect garment bag is something that you need help with, you are in the right place. In this article, we want to provide our readers with a list of the top 11 men’s garment bags for travel. As well as that, we will discuss our top buying tips and explain how to efficiently use a garment bag. If you are traveling around often enough to need a garment bag, then you’ve just got to invest in quality. 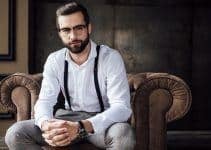 At the end of the day, you’ll be transporting around what is likely to be expensive formal wear, and, if you do not invest in something that is top quality, then you will be doing yourself a disservice, because it could damage your clothing. Investing in something that is high quality is easier said than done, but there are a few things that you can look out for. We will get in depth with most of these a bit later, but we will cover them quickly now, so you know what creates good quality. First, good quality is produced with good materials. If you are buying a garment bag that is made from high-quality materials, then you will be happy with your purchase. The choice of material can make all the difference. If it is too flimsy and futile, then you will find your clothing damaged or your bag ripped open. Instead, pick out your garment bag from materials that you recognize and that you know are going to be trustworthy. Another thing to look out for is the durability of the garment bag. This ties in with the material, but so long as the material is built to last you’ll be good. There’s nothing worse than spending your hard-earned money on something just for it to break on you shortly after. You can minimize this chance by investing in something that is durable. So here we are, the magic word: Durability. We all know what it means, yet many of us ignore it when buying things. That can range from clothing itself to accessories like a garment bag. You want your garment bag to last. What’s the point in buying something just to get rid of it shortly after? At the end of the day, you need to have a bag that is going to survive some intense use. If we assume that you are a businessman who is traveling frequently, you would want your garment bag to last you many trips. You would not want to be replacing it every other month, just because you are purchasing bags with poor quality and below average durability. Picking out a bag that is renowned for durability can really make all of the difference, and we strongly believe that you should go that extra mile to ensure that the bag you are buying is durable. Garment bags come in many styles. I know that will come as a shock to plenty of you. Surely, a garment bag is just something you can load your clothes into and then zip up, right? Well, kinda, but no. A garment bag can come in many different styles. 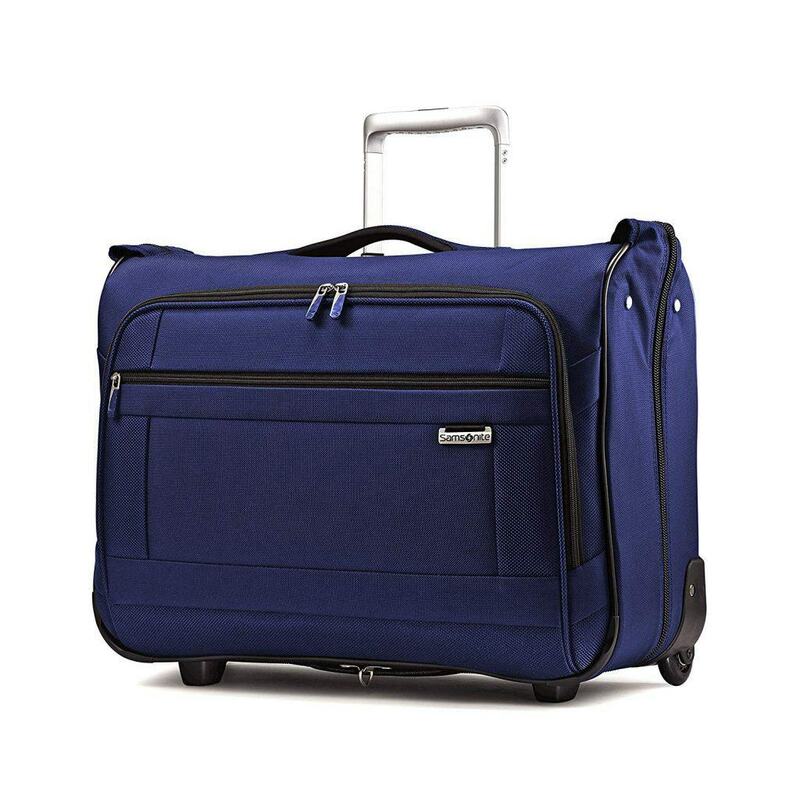 You can have just your basic zip-up bag that has a soft handle, but you can also get garment bags that are rolling and on wheels, as well as everything in between. If we go back to assuming that you are a businessman, then you may want a bag that is specifically designed for suits and also a bag that is on wheels. That’ll be great for you to carry through airports and when waiting around. Purpose sort of ties in with style but still deserves its own mention. Depending on why you are buying a garment bag will decide what garment bag you go for. If you are just going to be traveling by car to work, for example, then you can probably get away with a slightly cheaper garment bag that is basic in design to simply keep your clothes clean and unwrinkled. On the other hand, if you are an international traveler, then you will probably want to push the boat out. Your garment bag should have wheels, internal compartments for your travel accessories, and should hang to keep your things fully okay. That’s right, you can pick between features. With your garment bag, you can decide to go as simple or as flashy as you can imagine. If we start at the bottom of the scale, your garment bag can be basic. It will just have enough room to fit in your suit and other items of clothing, and then it’ll be zipped up and ready to go. For many of us, that’s perfect. We don’t need to push the boat out any further than that. For others, that’s not useful enough. You can choose from a multitude of features that will make your garment bag that little bit greater. One feature will be an extendable handle. Typically, you will have a handle that is joined to the bag and pretty rigid, which will allow you to walk around carrying your garment bag without much effort. However, if you are traveling all of the time, then you may want to get a garment bag with an extendable handle. This’ll make airport travel much easier and even better if you are cruising around the streets of a city with it. On that note, an extendable handle is pretty much conjoined with a carry on garment bag with wheels. If you think about it, you can’t have an extendable handle if it still has no wheels. 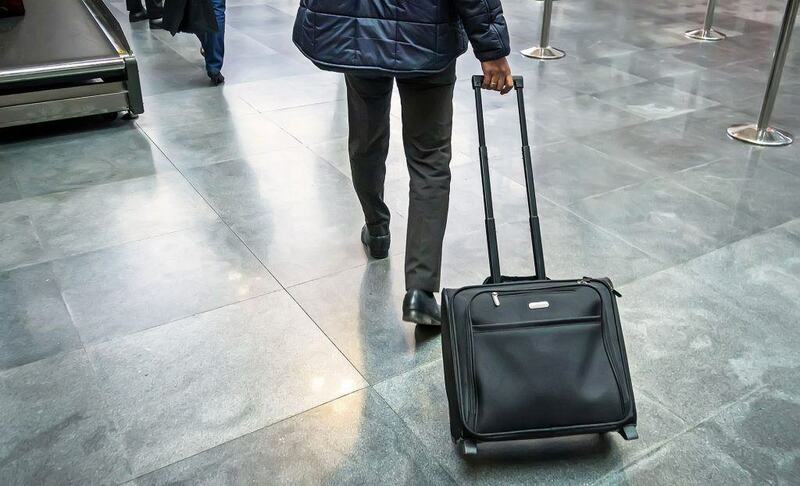 Getting a bag with wheels will make the travel process that little bit nicer, and you’ll rest easy knowing that your formal clothing is in there staying clean and happy. Other features include hangers and internal compartments. These are specialist features that will just make the travel process easier for people who require it. As much as we would love to deny it, the price of items really decides whether or not we can buy them. If we only have $1000 to spend on a new computer, then we would probably have to avoid looking for the latest iMac, for example. Even though the quality is superior, it is too expensive, and that simply erases the fact that the quality is superior. We need to stick to our budget. For us, that could be lower than yours is and vice-versa. What you need to do is pick out a garment bag that is within your budget range. In our selections, we will pick out garment bags that come in a wide range of budgets. This means you’ll be able to pick out your perfect bag regardless of your budget, and you will be confident that the quality is good enough to keep you happy. Choosing a bag on the reviews that you find online can actually be a great choice. At the end of the day, our word and recommendation can only go so far. You will want to cross-reference that with what other people think, too. If you can see that thousands of other people love the bag that you are looking at, then the chances of you loving it are high, and that’s great. On the other hand, customer reviews should not be your first port of call. You will want to look at the other factors that we have mentioned in this section first, and then reviews should be looked over once you have already picked out a bag you like because you are confident in the quality and the durability of it. Once you have picked out your bag, then making sure that others love the bag too can be a great idea. For the average business traveler, a garment bag that is made specifically for them is perfect. 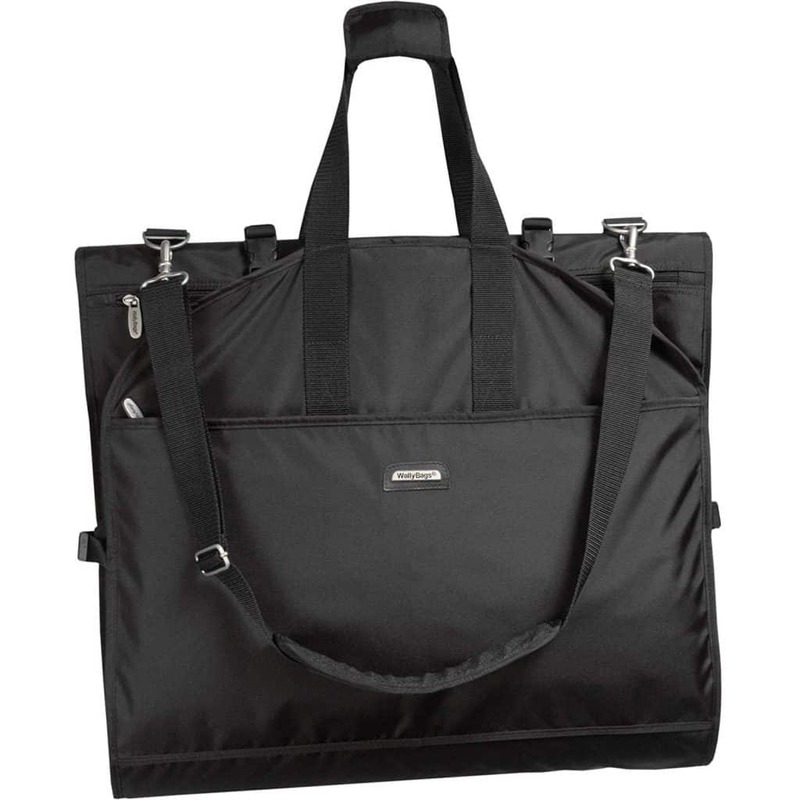 This carry-on garment bag is made with travel in mind, and business trips are its specialty. This bag makes your travel experience seamless and stress-free. 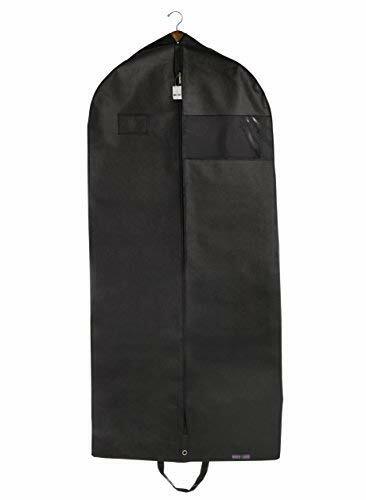 This is massively important, and regardless of whether you are on a business trip or a little city break with the wife, this Zegur garment bag keeps everything organized and takes the hassle out of packing the night before. You will be able to just lie your clothes in, making the most of the multiple interior zipper pockets, and this will hold everything from suits to dresses and shoes. Not only that, but this bag also has exterior pockets. This provides easy access to electronics and travel documents. This is perfect if you want to travel with this just garment bag and nothing else. You can keep your keys, wallet, and passport in the garment bag, and that’ll mean that your entire trip can be found within one bag, making your life that little bit easier. On top of that, the garment bag will keep your clothes free of wrinkles. As they say with their own description, you will ‘spend time relaxing, not ironing’. Not only that, this garment bag looks great and allows you to travel in style. It has a shoulder strap, so you do not need to have to worry about physically holding it the entire time, either, which is an added bonus for many of us. This bag is a great choice if you are a business traveler who would love to get away with only using one bag for the entire trip. This will keep all of your clothes clean and unwrinkled whilst allowing you to travel in style. It’s the perfect companion for your next business trip. An unconventional design for a garment bag, this doubles up as a duffel bag whenever you need it to. It is a fancy design that combines the functionality of a garment bag with the style and look of a duffel bag. This is great for travelers who love to look good wherever they are going. This will mean that their clothes are safe and secure, but they can also look like the part whilst cruising through the airport. A double win. This also makes it perfect for longer trips, too. Rather than just thinking about a night or two, this could survive a long weekend quite easily, and your clothes will thank you for it, as well. The bag, when ‘unraveled’, is a simple hanging garment bag. While chilling out in the hotel room waiting for the event to start, the bag can be laid out to ensure that you have a wrinkle free suit for the entire time. Getting a bag that looks good but also keeps your suit in a pristine condition eliminates many of the issues associated with travel. This bag has a huge 45L capacity, meaning that you will be able to fit many changes of clothing in it and be able to make the most of the additional space for extra pairs of shoes, passports, keys, and so on. It is worth noting this additional bonus: it is actually water-resistant. This means that you can rest easy, even if it starts throwing down with rain whilst you’re carrying it. You have high quality, durable material that is made to withstand rain and other elements. This bag from Modoker is made very well and with high-quality materials. It has enough space for up to a week’s worth of clothing, and you will be happy to know that your clothing will not get wrinkled or damaged in the process. 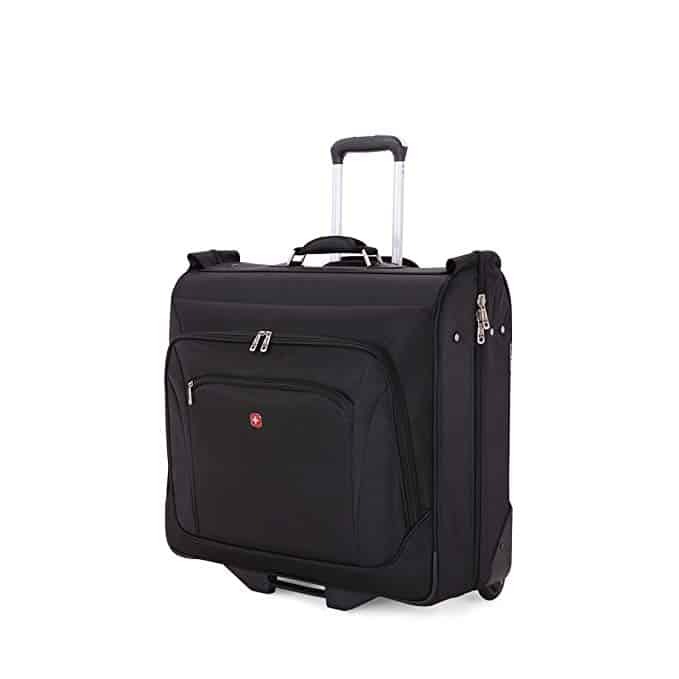 This massive 43” travel garment bag is as simple as they come and has the price to match. Don’t let that fool you, though; it may be simple, but that does not mean that it is not worth buying. It can hold a set of formal clothing for your trip quite easily. It has two reinforced carrying handles that make it easy to carry around, and it can be folded into a suitcase without worry. On top of that, you will be glad to hear that this bag has durable metal zippers. One of the biggest pains with most cheaper garment bags is that the zippers break, rendering the bag pretty much unusable. These zippers are durable and should survive much longer, meaning that your garment bag will stay useful. This bag is simple but can still be used on planes and trains, etc. One thing that this bag allows for is packing flat. This means that you can tuck it up inside another check-in bag, and you will be good to go. If you are a basic traveler and just looking for a garment bag that will keep your things clean and unwrinkled, then you’ve got your bag right here. It is cheap and does the desired job spectacularly. This garment bag is a rolling garment bag carry on that is perfect for travel and looking cool at the same time. It’s also handy at keeping your clothes clean and unwrinkled. The bag itself has a full-sized zipper opening, meaning that you are able to fetch and/or observe your suits easily and at any time. The bag itself fits at least a few of your formal outfits. This means that it is a perfect travel companion for a weekend break or something a bit longer, if you can survive on fewer clothes than the average person. On the exterior, there are two additional pockets that allow for a bit of extra storage. On the inside, there are multiple pockets that make this bag this perfect solo travel bag. Instead of taking your garment bag plus something else, you will be able to just take this and take advantage of the extra pockets to store your money, passport, or anything else that you may require. The wheels are smooth and effortless, making carrying this bag around a joy. To drag it around, you’ve got a retractable, locking handle akin to what you’d find on a suitcase. This means that when you’re bored of pulling it, you can just pick it up. It’s really up to you. If you want the best quality, then you’ve got to spend the top dollar. Everyone knows it, but not everyone wants to admit it. This is probably the best rolling garment bag that you can buy; if you can afford it, then get it. Garment bags do not need to be lifeless, and this bag illustrates what you can get if you just search for that additional bit of style. Made from 1200D 2-tone polyester, the front panel has EVA reinforcement. Without getting too technical, this just means that the material is durable and likely to withstand heavy use. This makes it perfect for someone who travels often and is likely check their luggage. We all know that airport staff treat your luggage like it’s full of cushions. They throw it about and don’t have any regard for what is inside. Picking a garment bag like this one will mean that, even if you choose to check it in, it should survive whatever they throw at it. On top of that, there’s even a detachable shoulder strap with non-slip pad. This means you’ve got all of the options covered. You can wheel it, manually hold it, or loop it over your shoulder. As long as you do not mind checking in your bags, then this one is perfect for you. It is made from reinforced polyester material that should prevent it from tearing and keep it in good shape, despite heavy use. A men’s garment bag is rarely luxurious, but it is an option if you really want it to be. This luxury garment bag is absolutely ideal, if that is something that you are interested in. The bag itself is made from top-quality, heavy-duty material that is soft to the touch. It is tough 600D polyester material that is expensive and functional in equal measure. It is water resistant and generally superior to the majority of other fabrics. To really illustrate their luxury choice of materials, they have the strongest zipper on the market. The bag is fitted with extremely durable, snag free, metal YKK no. 5 zippers. This means that they are going to survive whatever pressure you put them under, and this is absolutely perfect for something like a garment bag. You get the choice of four sizes; depending on the sizing of your clothing, you can get a bag that is molded perfectly to them. This makes it ideal for travel, as you get full control over what size your bag ends up being. The bag itself is made for travel and will keep your formal clothing in great, wrinkle-free condition. Some people love to travel in luxury, and this garment bag makes it that much easier. 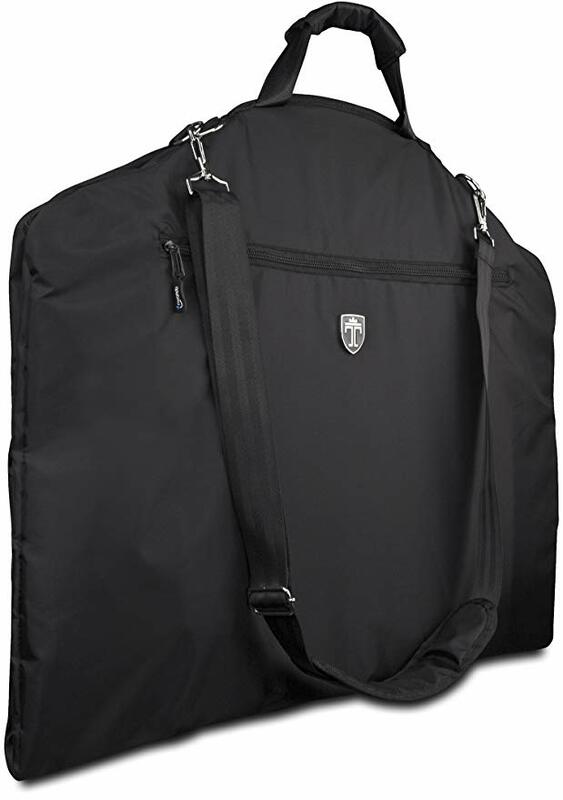 It is a luxury garment bag made with superior, durable materials and designed for travel. AmazonBasics is one of those brands that get a bad rap. Yeah, they aren’t world-renowned for their quality, but that does not mean that it is not worth a go. Their premium garment bag, in particular, is one of those items where you cannot understand why they are not more recognizable. The bag holds up to three suits and leaves plenty of room for belts, shoes, and ties. In addition to that, you can make the most of the mesh zipper pockets on the interior for anything additional that can be useful whilst you travel. On the exterior, you’ve got what they describe as a deluxe organizer. If it’s for business, this could be pens, notepads, and anything else. If you are going on a plane, then there’s enough space for your passport, too. As an added bonus, you get a one-year warranty with all AmazonBasics products, this garment bag included. So, if you’re left unhappy with your purchase, then you can get your money back – worth the risk when you consider the positives of the item. If you are looking for an affordable-yet-premium garment bag, then look no further. This combines some of the materials you would find on a luxury bag with the price of a basic bag. Definitely a great option. Straight off the bat, we know that this garment bag promises a high level of quality for a low price point. The brand name ‘Bags for Less’ insinuates that you will be getting a solid bag for less than you would usually pay. This is supported by their product description, as they claim it to be the best bag on the market. Whilst we do not want to confirm or deny that claim, we do believe that it’s a very solid bag. It includes many features that you would look for in a garment bag, like strong zippers, viewing windows, and carrying handles. This bag is highly breathable and a perfect way to transport your clothing without worry. This moisture wicking garment bag will safely store any of your formal clothing and keep things clean and safe over long distances. Coming at such a low price point, you can barely go wrong. They have made a bag that is particularly convenient and definitely useful. The bag can be doubled over, and you can hold both handles to make the journey that little bit easier. The only thing that we can see as being wrong with the garment bag is that it is perhaps overly simple and does not try to make the most of some features like wheels. However, for the price, this is just us being picky. For those of you on a tight budget, this is an ideal option for carrying your clothes over long distances. Whilst it is very simple, it ticks all of the important boxes and lends itself to being a perfect choice on a low budget. Occasionally you will come across a garment bag that genuinely has you looking at it in awe. For us, this was that bag. It really looks like they want to make your travel experience enjoyable, and by making a wheeled case small enough for carry-on luggage they have nailed the travel convenience boxes. The garment bag itself is shaped very nicely and looks great. Not only will you be transporting your suit wherever you need, but you’ll look great doing it. Unlike some other garment bags, where it’s just blatantly obvious that you’re walking around with your suit, these bags look like regular suitcases. The bag is extremely lightweight and smooth rolling. The spinner wheels make the most of ‘airflow’ technology, so you’ll be getting easy and smooth movement wherever you’re trying to drag it along. The integrated top and side carry handles mean that you can whip away the handle and still carry it around if you’re in a rush or just looking to get from one place to another with your bag as quick as possible. Whilst the bag is lightweight, it has an impressive amount of strength. The durability of the bag is fantastic, and you’ll be able to go around with the bag at all times. 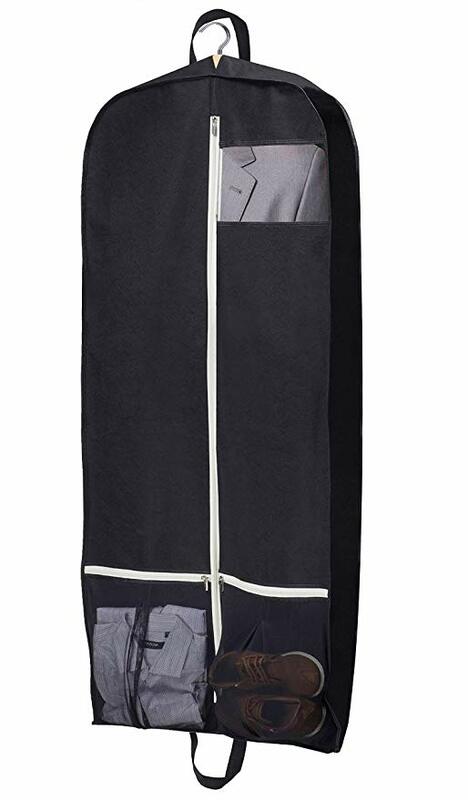 Looking great whilst carrying a garment bag is typically quite difficult, but this garment bag makes it easy. It looks great and is incredibly efficient. This garment bag is a one-size-fits-all bag. This is ideal for men who are bigger and need something that is slightly bigger. They claim that you can fit shirts up to size 60. With that being said, we are certain that the overwhelming majority of men will be able to fit their clothes inside of this garment bag. This bag is an excellent combination of garment storage and additional travel storage. Rather than being designed specifically for clothes and suits, it is also designed for other accessories. One added bonus with this garment bag is the additional laptop compartment. Obviously, we have been discussing garment bags with clothes in mind, but we also forget to mention that some garment bags are made to be the sole bag for travel. Having a laptop compartment suggests that the producers of this garment bag would love for you to take this as your only bag. The build quality is good, too. It is lightweight, yet it is still made from durable and water-repellent nylon, meaning that everything inside of the garment bag is going to be protected from damage. On top of that, there is premium anti-wrinkle protection to be found in this garment bag. Specialist anti-wrinkle plates ensure that nothing is going to be creased. The bottom line with this garment bag is that you are getting an all-in-one bag that can be taken on any of your travels. Not only will you be keeping your suits damage-free, but you will also be able to carry your laptop, cufflinks, notebooks, socks, and any other accessories. This garment bag is special because it has a tri-fold design. This design means that you are able to get it into an incredibly small size, and you’re able to fit it easily in any overhead compartments. Without the tri-fold technology, it would not be meeting the carry-on requirements for most airlines. The bag itself holds up to 6 garments, and you can place them straight from your wardrobe into your garment bag, meaning that the packing process is very easy. If there’s one thing that we love, it’s convenience. All men love it. This bag certainly provides it. The hanger clamps at the top of the bag ensure that any hangers are completely secure and thus unlikely to fall loose, causing clothes to become messy and wrinkled. On the exterior, you have plenty of pockets for anything else that you may need to transport. This can include other clothes, underwear, socks, and even unrelated accessories like jewelry, ties, keys, etc. The hundreds of customer reviews also reiterate the bag’s usefulness. Not only are men impressed by the quality of the bag, women have rushed to mention that the garment bag has kept their wedding dress clean, safe, and protected. Without sounding too dramatic, if the bag can keep a wedding dress in perfect condition, then we are sure that your clothes will be fine, too. Many travelers hate having to check in their bags. It is much easier to just make the most of the overhead compartments and walk straight off of the plane at the other end without having to wait. This garment bag makes that a possibility, as its impressive feature list includes a tri-fold design that allows you to fit it in any overhead compartment. If you’ve just bought your first garment bag, then you are probably wondering what is the right way of using it. Fortunately for you, it’s not rocket science. However, there is still a method to the madness. *For 12 days, you would probably need to keep washing your clothes, as you certainly won’t be fitting 12 outfits into a garment bag. If you get yourself a good garment bag, then you are effectively just wearing a glorified duffel bag, but that’s great. Not only are you now benefitting from the style of a duffel bag, but you are also standing there with a smug look on your face, knowing your suit is going to be in perfect condition when you arrive at the other end. Packing your bag is going to be the primary issue when learning how to use it. After all, once everything is already in the bag, you will be absolutely fine. You just have to walk around with it either in your hand or slung over your elbow. Simple. The packing process is the biggest issue. Figuring out how to pack your garment bag can seem daunting, but it can actually be a relatively simple process, so long as you follow accurate instructions. We particularly rate these, as they go in depth as to how you can ensure that your clothes will never come off of the plane creased again. It sums up many of the tips and tricks that you can use to pack your garment bag efficiently. When deciding what you take on your next travel adventure, you should probably know the differences between the different types of luggage you have available. In this section, we will compare the garment bag to other types of travel luggage. so that we can illustrate the differences. First of all, garment bags are made to just carry garments. Not only that, they are designed to do it very well. Rather than just allowing you to carry your clothes in a creased manner, they keep your clothes together and solid. They can come in a multitude of ways. Firstly, you can pick up garment bags that are very similar to other types of luggage. They will be wheeled, rolling, luxury – the list goes on. Ultimately, garment bags are designed to keep your suits clean and pristine whilst on the road. Otherwise, you’ll get off the plane and realize that your suit is most definitely not in a fit state. A suitcase is completely different, because they are designed to hold absolutely anything and everything that possibly could be needed on your travels. Whereas a garment bag will only be there to hold and keep your suit clean, a suitcase will play host to all sorts of clothing items and most likely full outfits. Suitcases are great, and everyone loves them. They allow you to take all of your clothes from point A to point B with no questions asked. However, they do not keep your clothes in an orderly fashion like garment bags do. As soon as you pick up a suitcase and grab it by the handle, there is almost no doubt that you’ve just triggered a 6.5 Richter scale earthquake internally, and your clothes are getting creased. Whilst they certainly have their purpose, and they are great for what they do, suitcases aren’t an exact like-for-like substitute for the garment bag, especially if you are looking to transport something like a suit. A carry-on case is very similar to a suitcase, except it is smaller, more compact, and slightly more convenient. A carry-on case is designed to not need to check in your bags at the airport. Away from flying, the carry-on is just generally a smaller version of a suitcase. You can comfortably fill a suitcase with a week’s worth of clothes at a time, but a carry-on will probably fit 5-7 days only at a push. A folding suit bag is pretty much a very basic garment bag. At first glance, it may be tough to tell the difference, but when you look up close you will be able to tell. This bag will just be there to pack your suit into, and then that’ll be folded up and ready to carry. This is efficient and highly convenient, but it is not all too useful as a travel companion. Unlike with a folding suit bag, you can get multiple types of garment bags, and many will include pockets and accessories that really help you to tell this bag apart from others. Choosing these products was definitely more complicated and difficult than it may seem. It is not simply a case of picking out 11 that we like the look of, because we wanted to make sure that they really were good suggestions and that we would not be doing you all an injustice by recommending them. The question is, then, how did we decide? Well, first of all, we wanted to narrow down our selections by going through and sorting them by the most important factors to look for in a garment bag. For this, we turned our eyes to the list of factors that we mentioned at the beginning. It was effectively a check box system that we designed, so it would have been highly hypocritical to ignore that. All garment bags that we picked out were top quality, durable, worth the money, and respected by many other people. Customer reviews meant a lot to us. 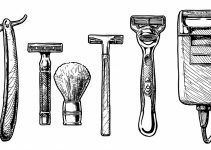 Whilst we try not to gauge our opinions entirely on reviews, we love knowing that our preconceptions on a product are reflected by the actual practical reviews by many men around the world. Ultimately, picking out the best 11 garment bags for men was a difficult task, but we really tried to get options for everyone and every budget whilst simultaneously only selecting those that we saw as being worth the investment. When you next go to travel with formal clothing, like a suit or nice dress shirt, you will probably wonder how you should be packing it. The answer is “with a garment bag”. However, it is tough to tell apart a great garment bag from an underwhelming one. To help you with this problem, we decided to dedicate this entire article to it. Your suits and clothes will be kept clean, fresh, and unwrinkled using a garment bag, and that’s what gives their simple design such inherent quality. Now that you’ve given this article a read, we would love to know whether or not you will try out a garment bag on your next trip. Let us know in the comments below, and we will get back to you as soon as possible!